I used to think that Houston was filled with nothing but talentless DJs. But Saturday night I went down to Lastrada for Desirous Party's Gangsta Girl Party. The crowd was hot, and the music was even hotter. 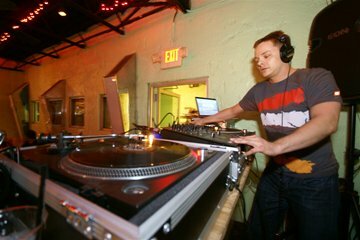 DJ Eddie Spettro had a pefect mix of top 40, hip hop, and classic dance music that kept the girls dancing til closing time. It wasn't just the song's he picked, but variation in mix, and play order, along with perfect beat matching, that kept the energy alive. I believe he was voted Houston's Top DJ by some local Magazine. The party was located on the top floor and patio of Lastrada in Montrose. Patios provided beatiful views of the Montrose area. I wouldn't call the crowd that attended that night anything that would cause the fire marshall to show up. I estimate 150 - 200 people showed up that night. But the ones that did show up were definately Houston's beautiful people. The crowd was dressed very upscale. The crowd looks more like what you would see at a Vegas NightClub. Stiletto platforms on all the ladies. Low cut tops and micro minis everywhere you looked. The crowd was very respectful. Normally in this atmosphere you would have single males causing trouble. But the crowd was very respectful. Parking is Valet only. If you don't want to pay for parking, you have to park on the street, which is fine as long as you can find a spot. Monstrose gets pretty crowded on the weekends. Also be sure if you park on the street you keep an eye out for the No Parking signs. I saw many cars towed because they were parking in the no parking zones. I highly recommend Lastrada's Saturday's with Desirous Party, and I also highly recommend DJ Eddie Specttro. That was the best mix I have heard since moving here. over 6 years ago. Definately restored my confidence in going out on the weekends. I've known Eddie for about 8 years and have followed his transformation from deep house guru to his current incarnation. He is and will always be one of my favorite dj's no matter what he is playing. The Houston club scene is definitely better off now that he is gigging around town.